Sleep, kip, catching Zzzz’s, shut-eye. Whatever you call it, our guess is, you’d like more of it. 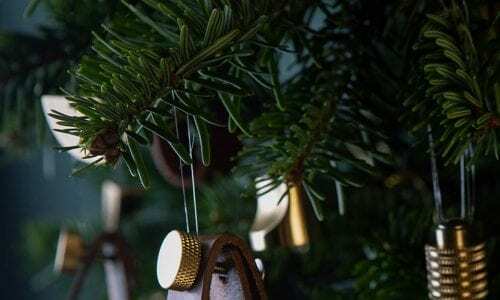 Without getting too science-y, it’s worth knowing that light is one of the main influences behind what’s called our circadian rhythm – that’s our daily ‘being asleep’ and ‘being awake’ cycle, to you and me. Mess with that rhythm and you’re going to feel permanently jetlagged. Give it a little helping hand, and boom, you’ll feel like you on a good day, every day. Getting your eyes adjusted for night time is the key to getting to sleep at the right time. A calming, sleep-inducing atmospheric glow is what you’re aiming for. Cue our very handy guide to choosing the right bedside table lamp. The most obvious type of bedside lamp is the one that you put on your bedside table. The most versatile type of side lamp, it doesn’t require new electrics (assuming that you haven’t escaped the rat race and gone to live off grid), it can be quickly installed – literally just plug in and go, and they’re also an inexpensive way of bringing in a new trend to a space without blowing the budget by redecorating your entire room. The downside? Nothing major really, but do bear in mind that they take up some of the space on your bedside table. So, if you’re a serial hoarder of bedtime paraphernalia you might want to tidy away that glass of dusty water, empty tube of hand/eye/face cream, alarm clock and stack of abandoned books to make a little room. 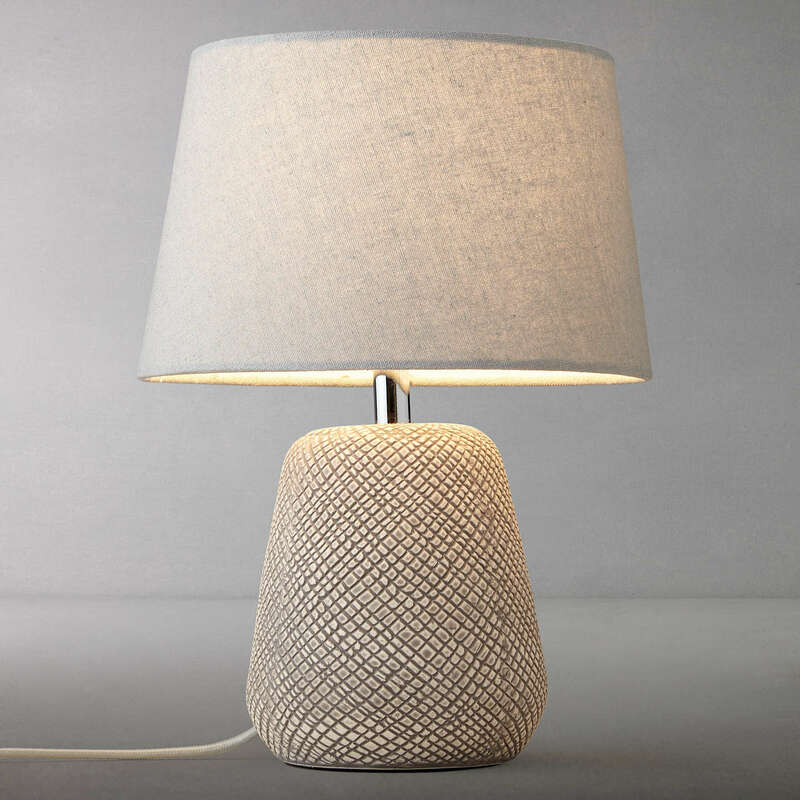 Bedside table lamps come in all shapes, sizes, styles and textures and we really do love them all. Let’s start with the classic lamp base with a shade. 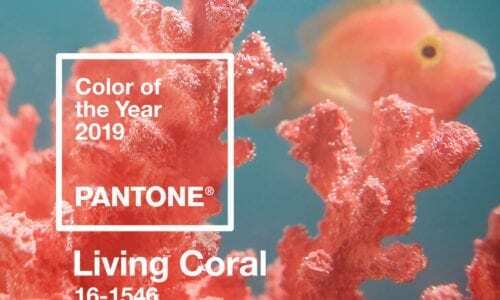 These are great for creating a general glow around your room – light enough for you to be able to read, but not so dazzling that it tricks your eyes into thinking it’s time to get up. A great all-rounder option. Once upon a time, having exposed bulbs in your house meant you were either a) a poor student or b) getting your style inspo from the set of Withnail and I. Fast forward a few years and exposed bulbs are not just acceptable, they’re positively hip. Let’s be clear though, they have come an awful long way and can now generally be found encased in beautiful metal cages or glass shades. 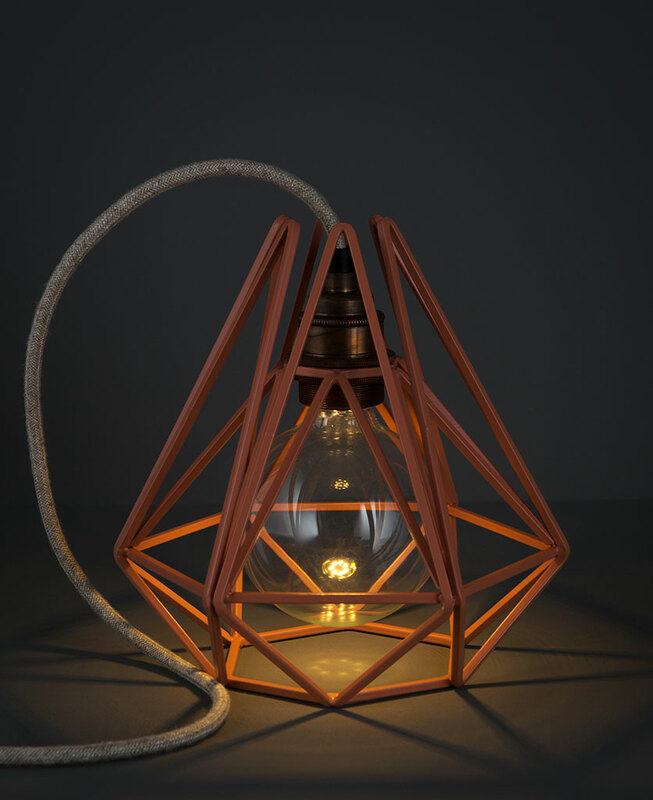 Our range of cage table lamps is a perfect example of how to make a style statement with an exposed bulb. Not only are these lamps incredibly stylish, with five colours to choose from there’s one for every kind of bedroom décor. They give out a gorgeous glow, creating the perfect ambiance for winding down. The genius thing about these side lamps is that they can be easily moved around and angled exactly where you want them too. I know, we really do think of everything. Another thing to bear in mind when choosing a bedside table lamp is the positioning of the switch. The last thing you want, just as you’ve got your ticket to the land of nod, is to have to leap out of bed and scrabble around to turn it off. 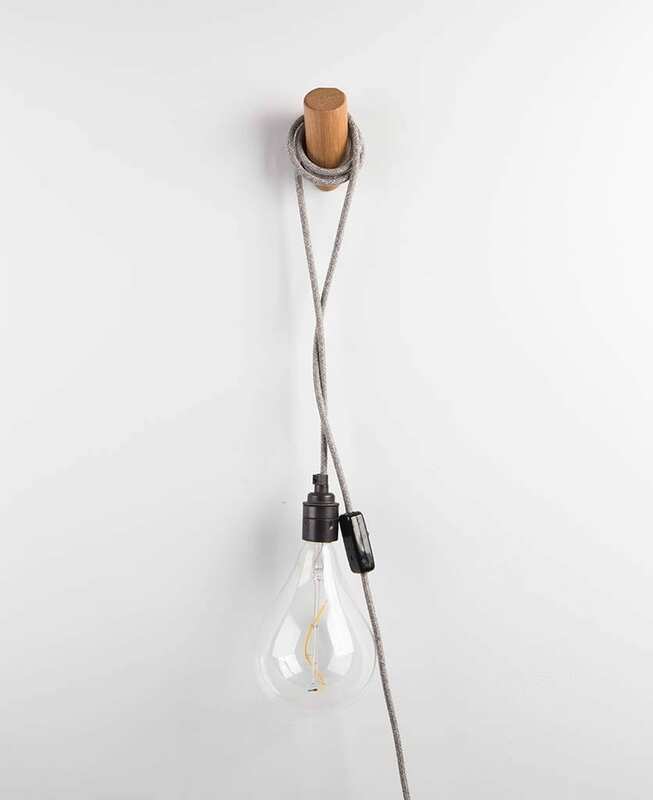 Our cage pendant lights have a handy inline switch so you can just roll over and it’s lights out folks. And while we’re making statements, another fantastic bedside table lamp is our EOS small tripod light. 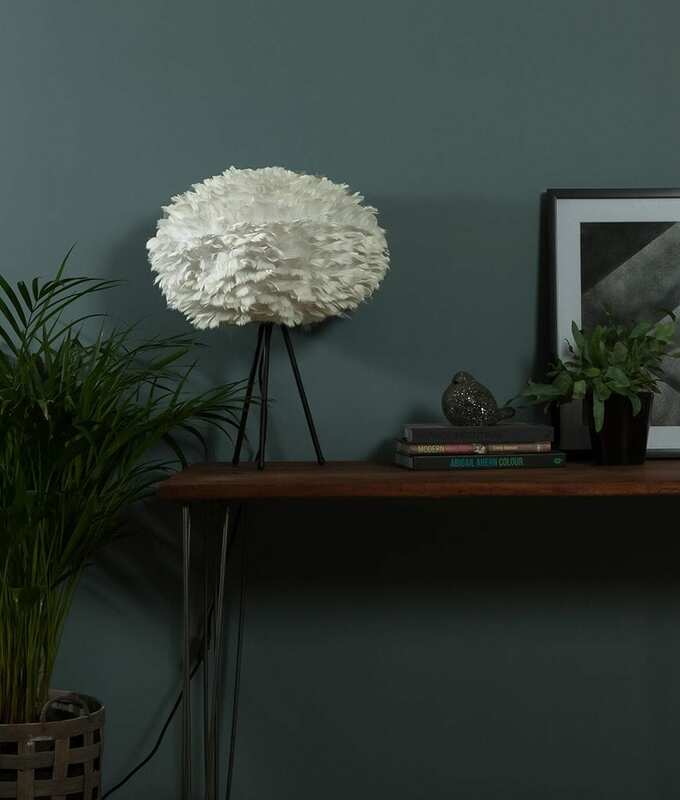 The beautiful goose feathers bring real texture to a room and diffuse the light beautifully. Perfect for drifting off, Zzzzzzzz. If your favourite part of day is snuggling into bed with a good book, then an angled table lamp could be just the thing you’re looking for. 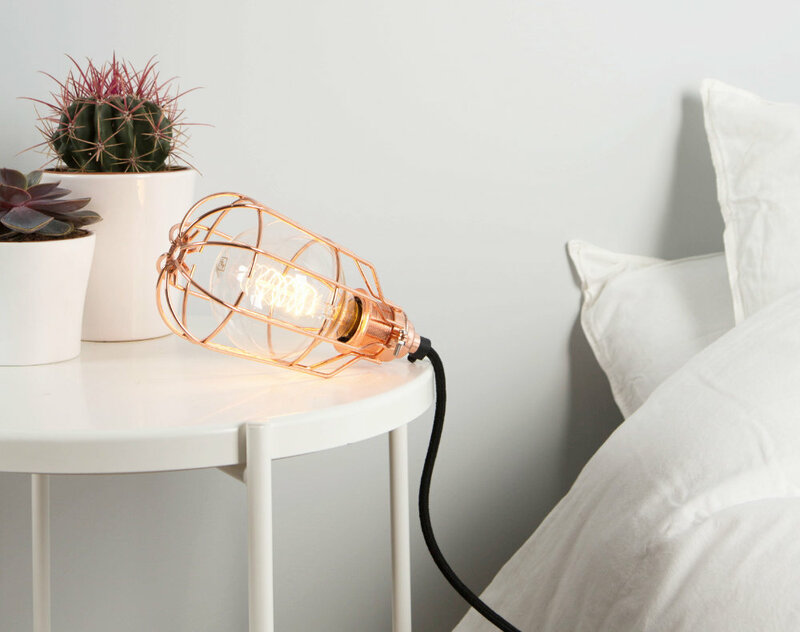 Used as a bedside table lamp, our Retro Metal Table Lamp not only looks cool, it also provides a great light for bedtime reading. Its adjustable arm means you can angle it into a position that casts the light exactly where you need it. This can be really useful if you share a room with an early bird who’s not so keen on staying up to read. A real relationship saver! If you like the idea of freeing up some space on your bedside table to create a more zen-like bedroom (or more realistically, make more room for your aforementioned ‘stuff’) then a wall mounted lamp or ceiling pendant is the thing for you. Some do require an amount of electrical jiggery-pokery, so if that’s not on your agenda at the moment, don’t fear, we have some fantastic wall mounted lights that make perfect bedside table lamps, and they don’t require anything more than your standard electrical sockets. First up is the fabulous Peg wall lamp. If you love Scandi-style interiors then there’s no better way of bringing this vibe into your bedroom. Such a simple design, but so effective. 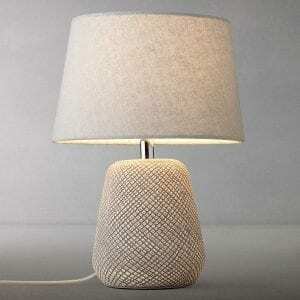 This bedside table lamp just plugs into your standard socket and the visible cord set becomes part of the overall look. Both parts of this side lamp come in three different finishes, and there are three different cord sets to choose from too. 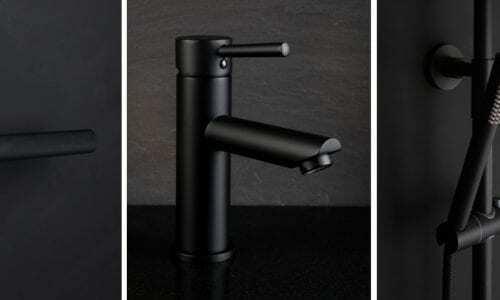 And we don’t mean to bleat on, but look at the handy inline switch – say no more! Next is our equally fabulous Hebden wall light. If you fancy something a bit chunkier but still want to keep your bedside table clear then this could just be the side lamp of your dreams. 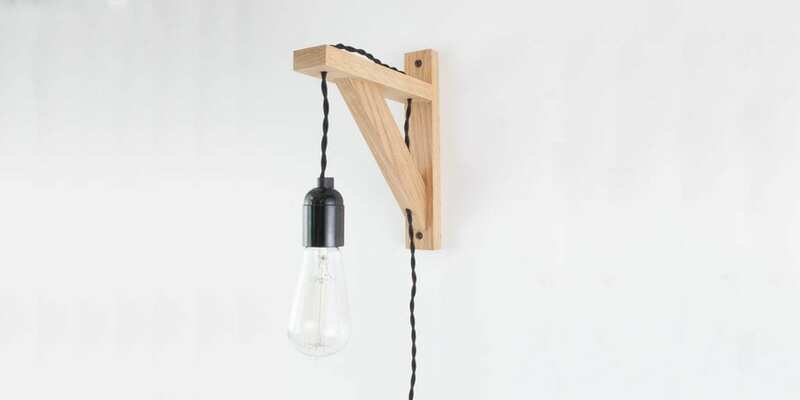 The gorgeous wooden bracket suspends the bulb from a tactile cord, casting an ambient, sleep-inducing glow around your bedroom. The biggie with this next type of wall mounted lamp is that there are no cables on show; just lights, hanging from your wall, uncluttered and looking marvellous. Think hotel chic; clean lines and no faff. If you already have the electrics in place for hidden cable wall mounted lights then, bingo. If not, be sure to call in someone who knows how to do this. Yes, it is a little more work, and a bit more expense, but your efforts will be rewarded. There are so many styles available that you can achieve this chic look whatever your style. Here are our favourite wall mounted bedside table lamps. For a cool retro look check out our Angler and Fender wall lamps. Incredibly hip just as they are, or add a shade if you’d like a more diffused light. 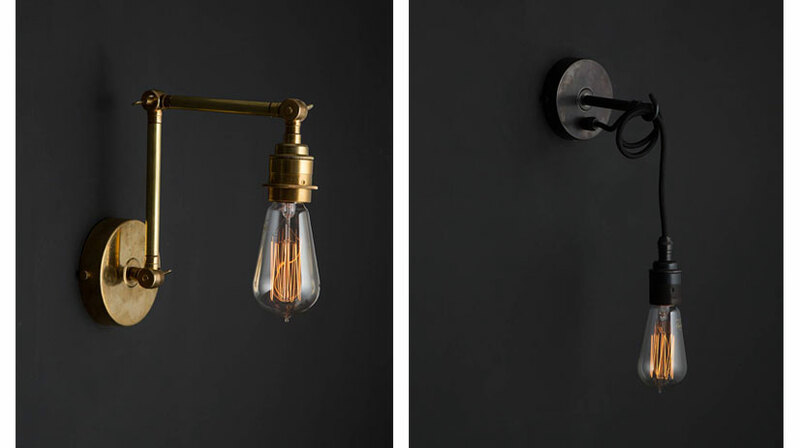 Either way, these make fantastic bedside reading lights. 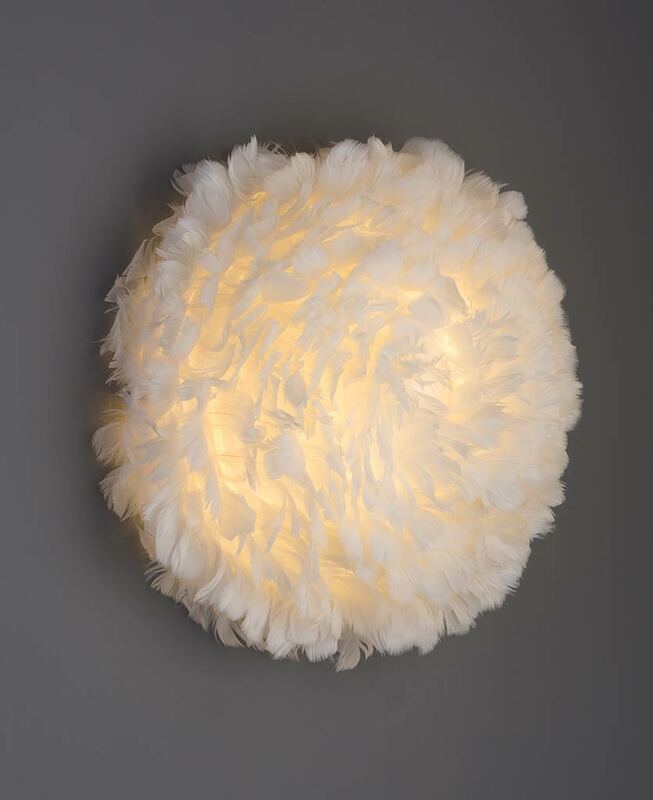 For a fabulously flamboyant look, it’s got to be the Vita Eos Up Feather Wall Light. Not only does it cast a gorgeous ambient glow around your room, it doubles up as a piece of beautiful wall art. When we think of bedside lamps, we don’t automatically think of ceiling pendants. Like wall mounted lights, they’re a really sleek way of lighting your bedside; no cables, no clutter, no fuss. Again, you’ll need a pro to wire these up, and of course there’s the re-decorating afterwards. But once installed you’ll never look back! Here are our favourites. 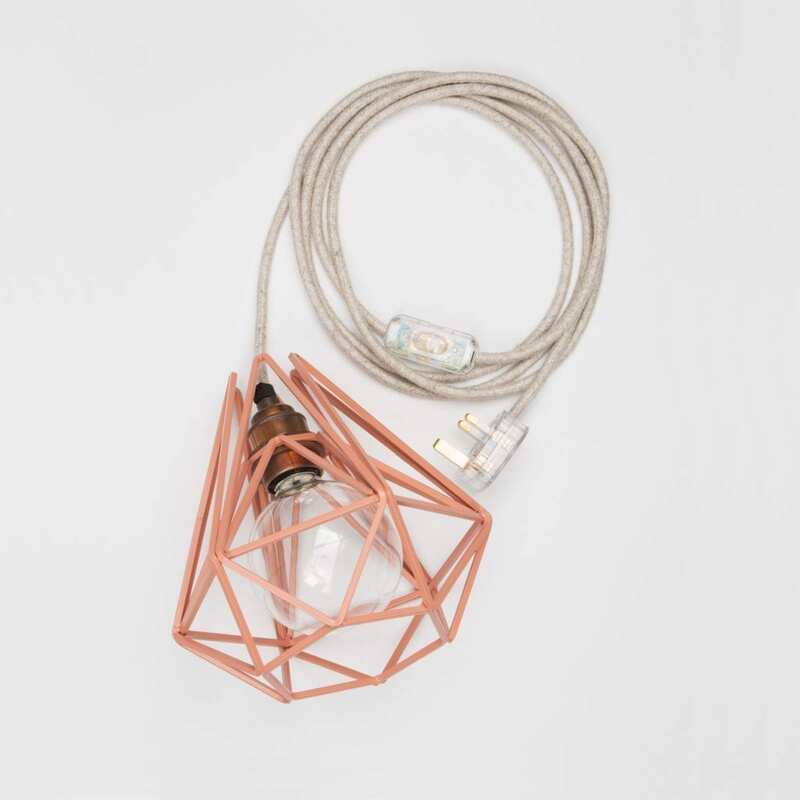 First up, our cage pendant lights. Like their table lamp counterparts, our cages come in the most gorgeous finishes. They cast a beautiful, relaxing glow for a perfect boudoir-esque ambiance. And last but by no means least, our Baya Nest Ceiling Light. 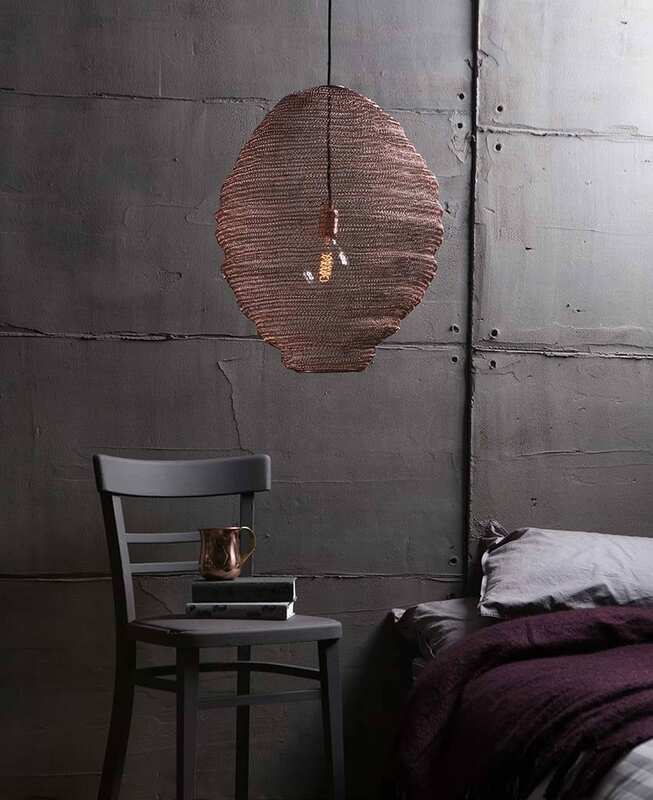 These metal mesh shades are a textural sensation and create a really cosy light. As with all our side lamps, they look just as good off as they do on. So, if you’ve decided to take the plunge and go for a wall mounted side lamp or ceiling pendant, don’t forget to get a switch installed within easy reaching distance of your bed! Whichever bedside table lamps you choose, we have the hardware to match. 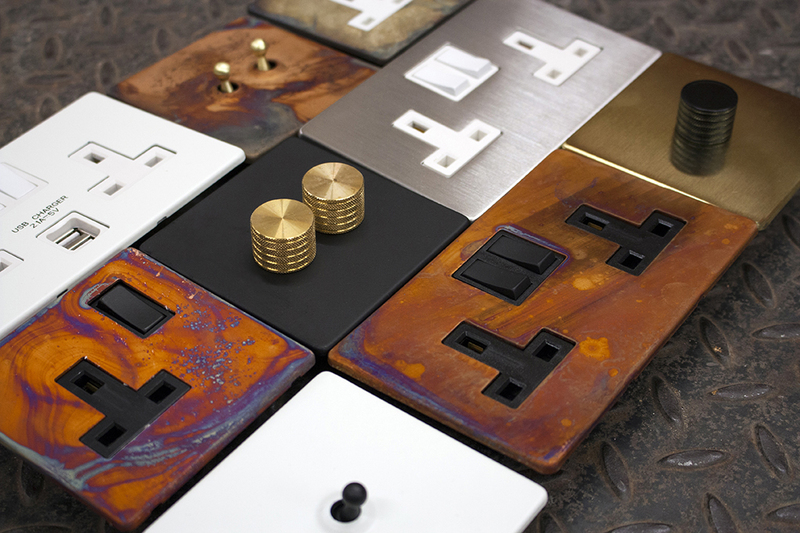 Check out our superb selection of switches, dimmers and sockets to complete the look. Ellie has THE sunniest disposition of anyone we know. She’s our resident interior designer and loves nothing more than sharing her insider pro tips to help us all achieve the interiors of our dreams. Lucky us! She regularly contributes to the blog and is one of the writing team who charms us with their entertaining product descriptions.